A popular chain of local scratchmade bread sandwich shops will soon add another location to its portfolio. Rubicon Deli is heading to San Diego's 4S Ranch for the opening of its 4th area outpost. A local destination for fresh baked bread sandwiches, Rubicon Deli will soon open a quaint eatery in the former Brett's BBQ space within 4S Commons Town Center. Like other San Diego locations, the sandwich shop will offer fast-casual counter service and a menu of fresh bread sandwiches, salads, and sides. Rubicon Deli began in Lake Tahoe, CA - owned and operated by co-owner Evan Corsiglia's mother, Cheri. The original deli eventually moved to Reno, NV, where Evan received an invaluable education that he would eventually build on for his own sandwich empire, as he learned to bake many styles of rolls, including garlic cheese, jalapeño jack, pesto, blue cheese and more, which Rubicon's San Diego locations continue to bake fresh every morning. 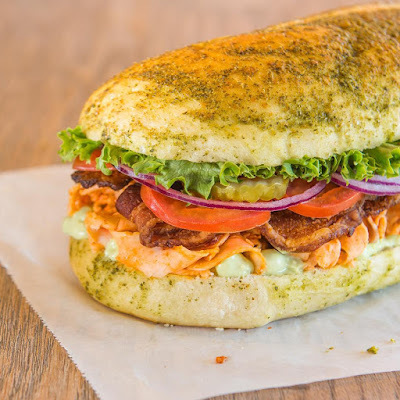 Rubicon Deli has locations in Mission Beach, Mission Valley, La Jolla, and last year announced expansion plans for Arizona. Rubicon Deli aims to open at 10550 Craftsman Way, Suite 185, by this Spring. For more information, visit rubicondeli.com.